This statistic shows the results of a survey among U.S. adults on the effectiveness of the U.S. Transport Security Administration (TSA) and its screening procedures at airports regarding the prevention of terrorism acts on airplanes. The survey was conducted in July 2012. The TSA is a government agency that handles security screening at U.S. airports. 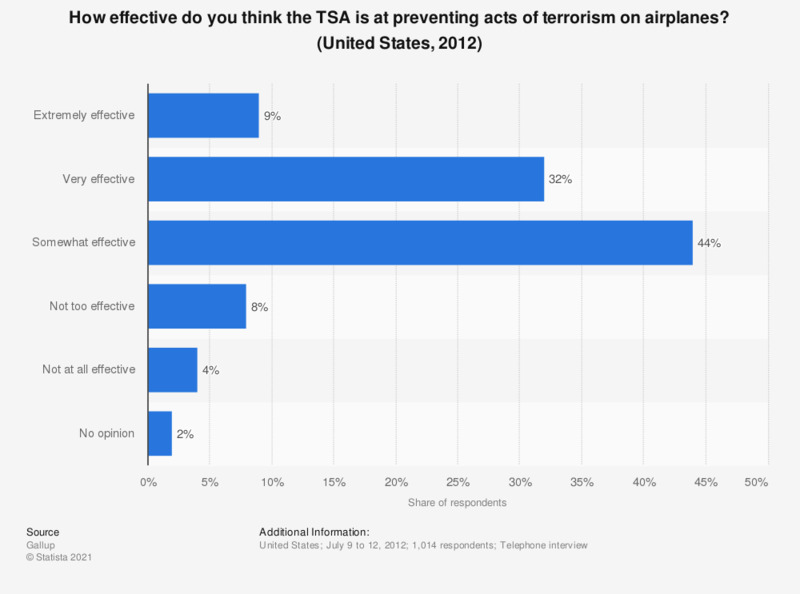 According to 9 percent of respondents, the TSA is extremely effective at preventing acts of terrorism on airplanes. The TSA (U.S. Transportation Security Administration) is the government agency that handles security screening at U.S. airports. The source posed the question as follows: "How effective do you think the TSA’s screening procedures are at preventing acts of terrorism on U.S. airplanes – extremely effective, very effective, somewhat effective, not too effective or not effective at all?"